The Hamaker constants for these systems, An and A!2, depend on the types of atoms comprising the materials and the atom density in each material. In principle, Hamaker constants can be calculated from molecular properties of the materials; however, these properties of the materials are often not known in sufficient detail. Hamaker constants for most condensed phases interacting with identical phases across a vacuum are in the order of 0.4 to 4 x 10'19 J. Hamaker constants of some aquatic systems of interest will be considered subsequently. Note that the total van der Waals interaction energy (J) between a sphere and a flat plate is directly proportional to the radius of the sphere. Note also the energy decays in inverse proportion to the separating distance. These relationships are useful in considering aggregation processes in water and wastewater treatment systems and in surface waters including rivers, lakes, estuaries and oceans. They indicate that the van de Waals interaction energy depends on the size of the particles and decreases inversely with the separating distance between them. We see also that, for the aggregation of identical spheres (Eq. (12b)), the interaction energy is one-half of that between a sphere and a plate in particle deposition in porous media (Eq. (11)). Eqs. 12a and b are subject to the restrictions of the Deijaguin assumption, so that h < ai, and a. From Eq. (14) we see that van der Waals interactions are always attractive for two particles of the same material interacting across a liquid medium. For dissimilar particles interacting across a liquid, A132 can be negative (e.g., when A,, < A^ < 42). For most aquasols, however, the net van der Waals interaction is attractive. Finally we note that these expressions for the Hamaker constant and the van der Waals interaction do not consider the retardation of the London-van der Waals force as the separating distance increases between the particles. 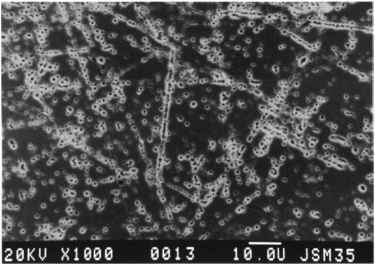 In the macroscopic or Lifshitz approach, the atomic structure of the colloids is not considered; solids and fluids are treated as continuous media. Interaction forces and energies between particles are derived from bulk properties of the media such as their dielectric constants and refractive indices. General expressions for interactions, such as Eqs. (8) to (12), developed previously, remain valid but the method of determining the Hamaker constant is changed. Here si and ej denote the dielectric constants of the solid phase and the separating medium, tii and n} are their respective refractive indices, and h is Planck's constant (6.626 x 10"34 J s). The first term on the right-hand-side of Eq. 14, termed the zero frequency term, represents the Keesom and Debye interactions; the second term arises from the London dispersion interactions. The van der Waals force between two particles of identical composition is always attractive. Similarly, the van der Waals interaction between any two phases in a vacuum or in air is positive (s3 = 1 and = 1; A is positive). 10"21 J at 20 °C. This contribution is negligible in air (e, = 1) but can be important in a polar medium such as water (^ = 80 when the ionic strength is less than 0.1 M.
 Metals and metal oxides have high polarizabilities and, as a result, have high dielectric constants and refractive indices. Because of their high refractive index, these materials have high Hamaker constants in both air and water. We will use Eq. (15), the approximate expression for the unretarded Hamaker constant of two identical materials acting across a third medium. It is interesting first to determine the coefficients for the zero frequency and higher frequency terms, ^kT and (3h v,)/(/(5V2). A comparison of these coefficients illustrates again the dominance of the London dispersion force (non-zero frequency terms) over the Keesom and Debye interactions. Comparison of these two results indicates (1) dispersion interactions dominate the Hamaker constant and the van der Waals interaction of alumina in both air and water and (2) the Hamaker constant in water is significantly less than in a vacuum or in air. From these calculations we see again that the Hamaker constant is larger in air than in water. In addition, the zero frequency term (Keesom and Debye interactions) is much larger than the dispersion interaction for this organic substance in water. We have considered three types of van der Waals interactions: Keesom, Debye, and London, or orientation, induction, and dispersion interactions. Each of these interaction energies between phases decreases with increasing separating distance. The Keesom and Debye interactions are derived with classical electrostatics. The inverse dependence of these interaction energies with distance (Eqs. (8a,b), (11), and (12)) holds to large separations. The London forces, in contrast, are electromagnetic and involve the time taken for the instantaneous electric field of one atom to reach a second atom and return. For an atom with a characteristic orbiting frequency of 3 x 1015 s_1, the distance traveled by light during one rotation is (3 x 108 m s"')/(3 x 1015 s_1) «100 nm. As a result the returning field can find the direction of the instantaneous dipole to be different than before; the resulting interaction is less attractive and the dispersion energy between the two atoms decays faster as the distance increases. This is called the retardation effect. Note again that it influences only the dispersion interaction, the orientation and induction interaction energies remain non-retarded. For interactions between two molecules in a gas phase, retardation becomes important only at distances where the van der Waals interactions are already very weak so the effect is generally not significant. However, between colloidal particles in water, retardation can be significant and is often taken into account. There are several approaches in doing this. When the Hamaker constant is evaluated using the microscopic (Hamaker's) approach, the result includes only the London-van der Waals dispersion force and is subject to retardation that causes A to vary with separating distance, h. There is no simple description of this retardation that describes the interaction energy over the entire range of separating distances. A number of approximate analytical expressions have been developed to describe retarded interactions for different geometries, particle sizes, and separating distances . Some of these are presented in Table 1 together with companion expressions for non-retarded interactions. The expressions in Table 1 for retarded interactions (Eqs. (2), (4), and (6)) all contain A, the characteristic wavelength for the dispersion interaction, often assumed to be 100 nm. Eqs. (3) to (6) include the Derjaguin approximation in their development and so incorporate the requirement that the range of the interaction be smaller than the size of the particle; h « a. This can limit their accuracy for particles at the lower end of the colloidal size range. The macroscopic or Lifshitz approach to calculating the van der Waals interaction includes the orientation, induction, and dispersion forces and also incorporates the retardation effect. As in the microscopic method, with the Lifshitz approach there again is no analytical expression relating the retarded van der Waals interaction force and the separating distance between two objects that is accurate at all separations. The Hamaker constant is not actually a constant; it can be viewed more rigorously as the Hamaker function, A(h), that varies with the separating distance. Numerical solutions for A(h) are available  and several approximate analytical expressions have been also developed. For non-retarded interactions, the Hamaker approach and some applications of the Lifshitz theory give the same geometric distance dependency so Eqs. (1), (3) and (5) in Table 1 can be used to describe geometric effects with both approaches. The ionic strength of an aqueous solution has essentially no effect on the dispersion or London-van der Waals interaction. The zero frequency contribution (the Keesom and Debye forces), in contrast, are electrostatic and can be screened by the free ions in the solution. At high ionic strength (I > 0), their effective range is less than 1 nm  so that attraction between most materials in such solutions is determined by the dispersion force. For biological materials this may also be weak, so that van der Waals attractive interactions between biological materials in estuarine and marine systems may be quite small.